Huevos a la flamenca (flamenco eggs) are one of the tastiest Spanish egg recipes. Easy to make, it is an old and very traditional Spanish egg dish, with many different versions, depending on the area they come from. 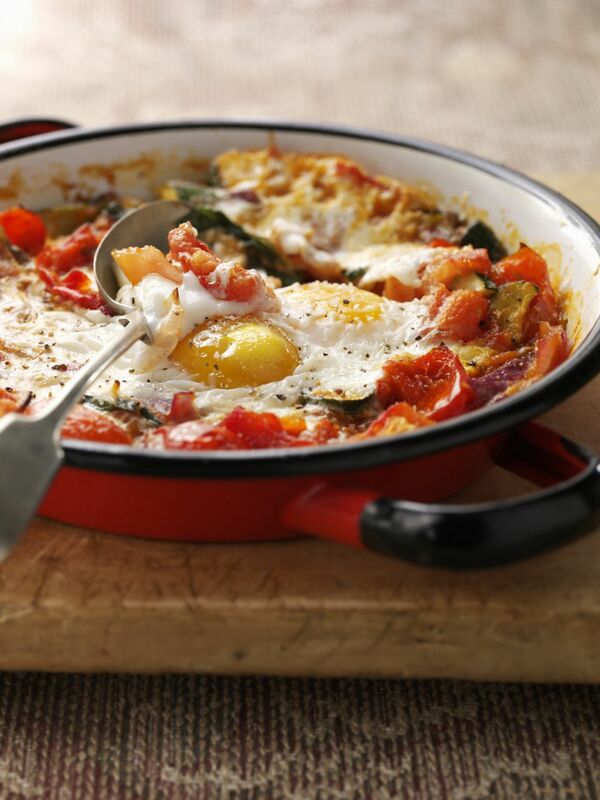 The most simple version is baked eggs with stewed tomatoes and peppers, while other versions opt to add in meat. This version of the recipe includes both chorizo and morcilla sausages, along with onion, garlic, pepper, and homemade tomato sauce. The stewed vegetables and meats are topped with a couple of eggs and baked in the oven in individual clay dishes. If you prefer not to bake the dish, you can also fry the egg separately and place it over the meats and vegetables. Top with garlic breadcrumbs (migas) and serve piping hot. While it may seem like a good dish to serve for breakfast, in Spain you'd never find it on the breakfast table. Eggs in Spain are eaten almost exclusively at lunch and dinner—which means that you can eat this delicious dish any time of day! Cut the chorizo sausage into thin slices. Cut the morcilla sausage into slices approximately 1/2 inch thick. Chop the onion and slice the garlic cloves. Chop the peppers, removing the membrane and seeds. Heat approximately 2 tablespoons extra virgin olive oil in a large, heavy-bottomed frying pan. Fry the chorizo and morcilla slices. Remove and set aside. In the same pan, sauté the onion, garlic, and pepper. Add the tomato sauce, paprika, and sherry wine and reduce. Divide the onion and pepper mixture between four glass, clay or ceramic oven-proof dishes. Arrange the pieces of chorizo and morcilla sausage on top in each of the dishes. Break two eggs on the top of each dish. Place the dishes in the hot oven until egg whites are cooked, about 10 to 15 minutes. While eggs are baking, crush stale bread into small pieces or crumbs using a mortar and pestle or food processor. Peel a garlic clove. Heat the same frying pan, adding 1 to 2 more tablespoons of olive oil. Add garlic cloves to oil and fry without burning the garlic. Remove garlic. Add the breadcrumbs to the pan and stirring, browning the crumbs quickly. Remove crumbs from pan and put in a bowl. When eggs are cooked, remove from oven and sprinkle seasoned bread crumbs over each dish.